Today is March 31st, the final day of the Financial Year 2015-16. Financial year starts from 1st April and ends on 31st March. There are many new amendments or changes that have been proposed for the next Financial Year (2016-17). In this article, let’s discuss some of the major Personal Finance changes that you need to know. Some of these new proposals might affect most of our personal finances. Service tax will be increased from the existing 14.5% to 15%. Budget 2016 proposes to levy 10% Dividend Distribution Tax (DDT) in the hands of the investor who receives dividend of Rs 10 Lakh or more in a financial year. Cash purchases of goods & services which are worth more than Rs 2 Lakh & purchases of luxury cars worth more than Rs 10 Lakh will be subject to Tax Collection at Source (TCS). Central Board of Direct Taxes (CBDT) has informed that the interest income earned on deposits should be shown in the return of income even in cases where Form 15G/15H has been filed. The interest income has to be shown in ITR if the earning is not exempt under Section 10 of the Income-tax Act and the total income of the person exceeds the maximum amount not chargeable to tax. According to the Budget 2016 proposals, sovereign gold bonds will be exempted from capital gains (LTCG) tax at the time of redemption. So, if you hold the gold bonds till the maturity date and if you make any long term capital gains when redeeming your gold bonds, there will not be any capital gain taxes on the profit you make. 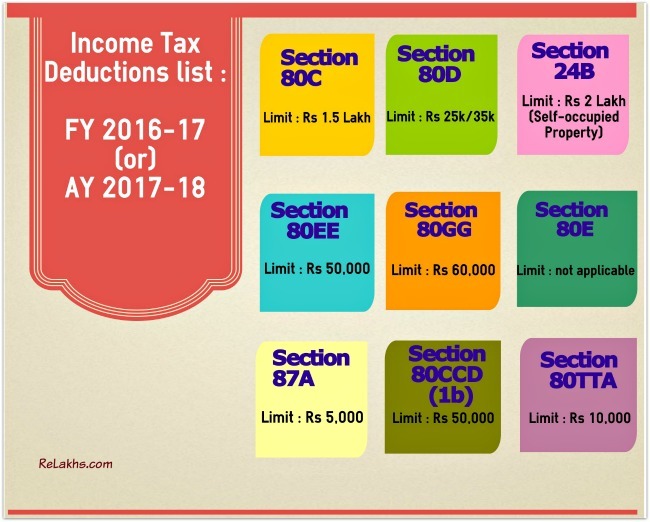 For complete List of Income tax deductions for FY 2016-17 (or) AY 2017-18, click here..
For detailed List of TDS rates for FY 2016-17, click here..
NPS Withdrawal : 40% of corpus withdrawal at the time of retirement will be tax exempted. 60% of the corpus will be subject to tax if you withdraw it. To avoid taxes, you have to invest this 60% corpus amount in an Annuity product. Death claim (if any) received under NPS scheme is tax exempt. One-time portability from EPF to NPS will be provided and this will not be subject to any taxes. Inoperative EPF Accounts : The Employees Provident Fund Org has decided to provide Interest on Inoperative Accounts from 1st April, 2016. This move will benefit over nine crore such account-holders having total deposits of over Rs 32,000 crore. 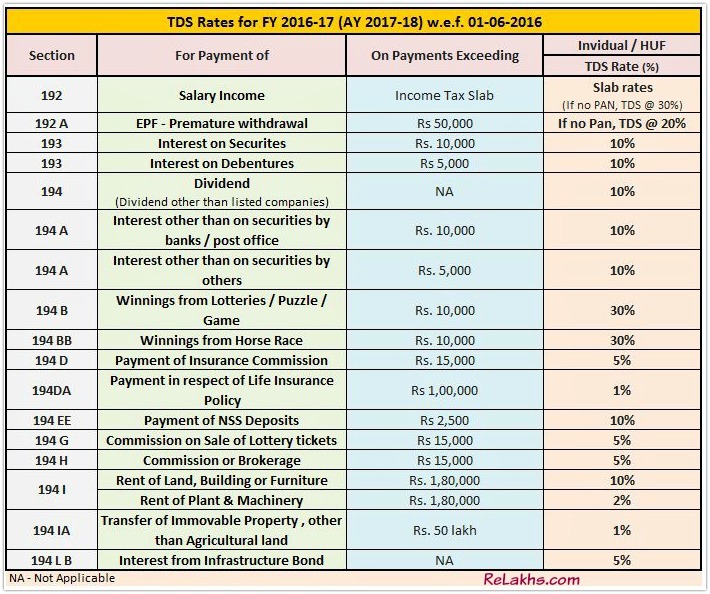 Post Office Saving Schemes : The government has decided to revise Small Saving Schemes interest rates on a quarterly basis starting from 1st April, 2016. High Value Financial Transactions: With an aim to curb black money mess and to track high value cash transactions, the government has decided to implement new reporting guidelines w.e.f 1st April, 2016. Cash Deposits in Banks : Banks will have to report cash deposits aggregating Rs 10 lakh or more in a financial year in one or more accounts of a person. Term Deposits in Banks : Banks will have to report cash deposits aggregating Rs 10 lakh or more in a financial year in one or more Time Deposit accounts of a person. These norms will also cover deposits and withdrawal made in Post Office Account. Investments in Financial Securities : A company has to report receipt of Rs 10 lakh or more from a person/an investor in a financial year for acquiring bonds, debentures, shares or mutual funds. Bank Savings Account: Reserve Bank of India (RBI) has asked Banks to pay interest on savings banks account on quarterly basis or shorter intervals from next Financial Year. Though the interest rate on Savings account is calculated on a daily basis, at present the interest amount is credited in savings bank account on half-yearly basis (every 6 months) only. ECS (Electronic Clearing Service) will be replaced NACH (National Automated Clearing House) from 1st April, 2016. NACH is a centralized system which will consolidate multiple ECS systems that are currently available in the country. All banks have to switch to this new platform by 1st May, 2016. So, from May 2016 onwards you have to use this facility instead of ECS. This is applicable to all your Utility Bills, Insurance Premium payments, Credit Card Bills, SIP of Mutual Funds, or in fact any payment, which is recurring in nature. Kindly note that your existing ECS mandates will not be affected. But fresh registration of ECS will not be accepted. The government has also proposed to launch ‘Start-up India’ mobile APP & online portal in the month of April 2016. Registration of a startup company can be done in a single day through Startup India Mobile app / portal. The much awaited online EPF withdrawal facility might be launched by the EPFO during the next FY. Dear sudhakar..Kindly note that I do not provide suggestions on direct equity (stocks). fantastic Article..Good Finacial Year start for everyone with this article. Thank you very much for sharing with all of us. Have been reading all the wonderful info u provide. Can u also make a few suggestions for NRI ‘s on how to plan their investments. Thank you for following my blogs. Whether NRI or Resident Indian, the starting point would be Financial Goals and then we can identify the right products based on the investment objectives/time-frame. So, if you are an NRI and would like to ask any specific queries related to NRI investments, do leave your queries and I will surely try my best to reply to them at the earliest. Thank you so much for ur reply. 4. 25k/month in mutual funds. Should I invest in property or stock markets or increase the mutual funds? Will I be taxed if the benefits of the mutual funds increase by more than 2.5lk p.a? Wat are the best ways to avoid taxes? 1 – Kindly share details of LIC policy (plan name, commencement date, tenure). 2 – Kindly read: Why one should avoid investing in FDs for longer period?. Are these investments towards any specific goal(s)? 3 – May I know your investment horizon & goals? If ok, share your MF portfolio details. The 6 most common personal finance mistakes..
Investment in financial securities need some clarification. Earlier 2 lakh and above in MF, 5 lakh and above in bond/debentures, 1 lakh and above in shares etc. were reported through AIR. Now article states that a company has to report receipt of Rs 10 lakh or more from a person/an investor in a financial year for acquiring bonds, debentures, shares or mutual funds. Does this mean that limits set earlier in AIR have been revised upward to Rs 10 lakh and above? Dear Mahesh..Yes these are the new limits and effective from 1st April, 2016. Since I am affecting a switch more than the present limit, I talked to my MF customer service and they say the limit for AIR reporting remains at Rs 2 lakh only. Can you please help me with relevant rules, sections of recent budget which can be shown to them. Dear Mahesh..As of now I couldn’t trace out the relevant notification, but I believe that the new limit is Rs 10 Lakh. Thanks a lot for the information. 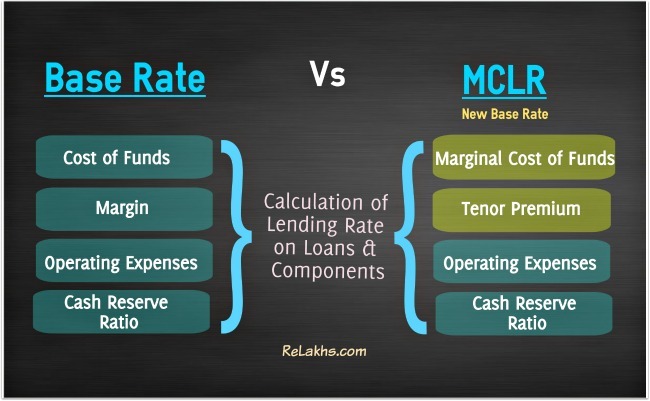 Have a doubt.With the introduction of MCLR , as a simple home loan EMI payer, how is it going to affect me?? 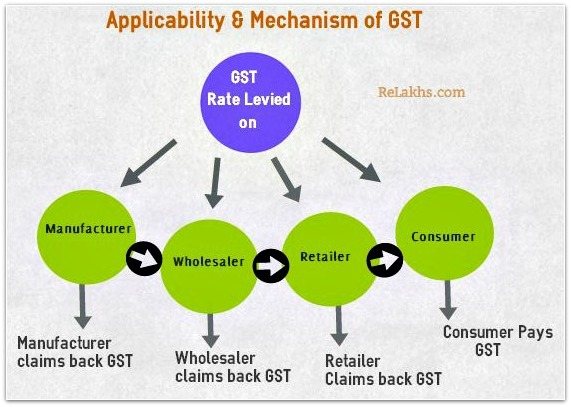 Suggest you to kindly go through this article and revert to me if you need more info : MCLR – Details, components & Review. Thanks a sir for the above info…Keep it up .. Thank you dear Jitendra ..Keep visiting! Thnx for providing such h a valuable info at one place.Keep it up dear. Thanks Sreekanth for consolidated everything and sharing. Dear Shravan ..Thank you! Kindly share the article with your friends. Awesome article. Thanks for such a nice info in one go!